Capital Gazette Shooting: New Details Emerge Police confirm that the suspect, Jarrod Ramos, was found hiding at the scene. Officers cornered him roughly two minutes after the first 911 call came in. 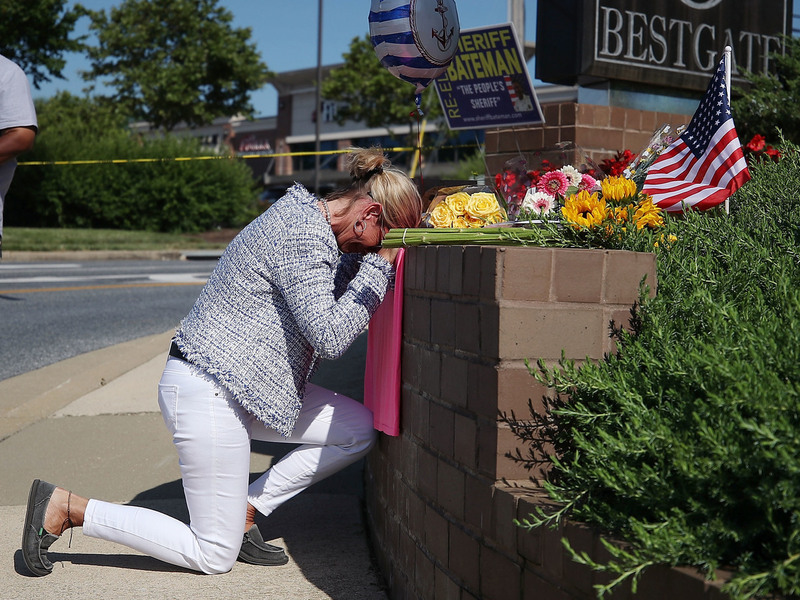 Lynne Griffin pays her respects at a makeshift memorial outside the Capital Gazette offices, one day after a gunman killed five people in its newsroom. Griffin was a journalism student under John McNamara — one of the people killed Thursday. The man charged with murdering five people in the Capital Gazette newsroom in Annapolis, Md., on Thursday had previously been investigated over threatening comments toward staff members, Anne Arundel County Police Department Chief Tim Altomare said Friday. In 2013, a detective had looked into the threatening remarks made by Jarrod Ramos, who was angry over coverage of him in The Capital newspaper, and spoke to representatives of Capital Gazette. No charges were filed — a decision that Altomare said was made out of "a fear that doing so would exacerbate an already flammable situation." That was one of several details to emerge in a news conference on Thursday's shooting. Other revelations include the fact that police used a facial recognition system to help confirm Ramos' identity. Altomare also said the suspect had tried to hide as officers cornered him roughly two minutes after the first 911 call came in. "I think fight or flight kicks in," Altomare said of the suspect. "I don't know why, but flight won." Word that police used facial recognition emerged after some news outlets reported that Ramos might have damaged or altered his fingerprints — reports that police said were inaccurate. On Friday, Altomare said police ran the suspect's prints but "we had lag getting answers" from the computer system. Because of the delay, police turned to facial recognition, the police chief said. The suspect charged into the Capital Gazette offices and used a pump-action shotgun that Altomare said was "legally purchased a year or so ago" to kill five staff members and injure two others on Thursday. In Maryland, shotgun sales are not regulated by state law and only require filling out a federal form and passing the FBI's National Instant Criminal Background Check System. The gunman also had barricaded the rear doors of the news company's building — an apparent attempt either to keep victims from fleeing or to keep police out, Anne Arundel State's Attorney Wes Adams told reporters Friday. "The fella was there to kill as many people as he could get," Altomare said. Police have carried out searches of Ramos' apartment and car. "We did find evidence at the residence," Altomare said, adding that investigators had found signs that Ramos had planned the attack. Even in light of Ramos' animosity toward the newspaper, Altomare said, "We can't fathom why that person chose to do this." In 2012, Ramos, 38, sued the news group for defamation, based on The Capital's coverage of a criminal harassment case against him. His suit was dismissed — but in the years since, he repeatedly used social media to defend himself and to go after The Capital's journalists. Ramos, who is facing five counts of first-degree murder, was denied bail at a hearing Friday. Vigils for the victims and their families are scheduled to be held in Annapolis on Friday night. Maryland Gov. Larry Hogan has ordered the state flag to be lowered to half-staff until Monday in their memory. "There is no amount of clarity that will ever explain or nullify the pain that comes with losing so many lives for so little reason," Hogan said in a statement Friday morning. He added, "journalism is a noble profession upon which our democracy depends, and we will fight to defend it." "The Capital Gazette is my hometown paper," the governor said. With the help of its sister publication The Baltimore Sun, the newspaper was able to report on its own tragedy, publishing a Friday edition devoted to the attack that turned its newsroom into a crime scene. It was "a horrific shooting," President Trump said shortly after noon on Friday. "Journalists, like all Americans, should be free from the fear of being violently attacked while doing their job," Trump said. He added, "My government will not rest until we have done everything in our power to reduce violent crime and to protect innocent life."